Meghan Markle - Have you tried the Meghan Markle Pizza yet? 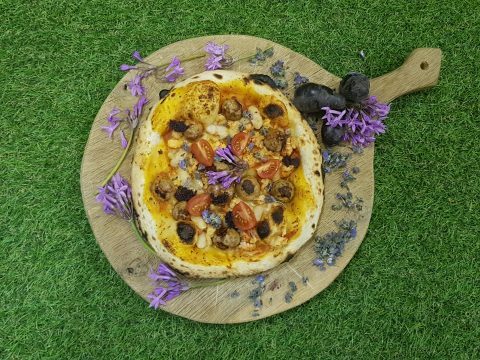 A Lancashire-based importer and supplier, known as the ‘Preston Pizza Oven Pioneer’, has taken a basil leaf out of the regal history of pizza and created his own tribute to royalty, to mark the US celebration, National Pizza Day. Andrew Manciocchi, of Valoriani UK, who first pioneered wood-fired pizza ovens in the UK some 15 years ago, when everyone thought he had perhaps spent a little too long in the Tuscany sun and told him pizza ovens would never catch on, has created the ‘Meghan Pizza’ – a 2018 update to the Margherita pizza. The ‘Margherita’ pizza was created in Naples in 1889, by Raffaele Esposito of Pizzeria Brandi, when the queen of the fairly newly united Italy, Queen Margherita of Savoy, wife of King Umberto I, was said to have been sick of the French gourmet cuisine that predominated in her social circle and did what was probably 1889’s version of ringing out for pizza. She summoned Raffaele to the kitchen of the Capodimonte Palace and he cleverly cooked her a Naples special with a twist – a traditional Neapolitan pizza topped with basil, mozzarella and tomatoes, to portray the green, white and red bands of the Italian flag. The 2018 ‘Meghan’ pizza’ has not been designed for a queen, but for a future princess, by future marriage, if not by title – Meghan Markle. Andrew Manciocchi has created it as a fusion of food that it is said Ms Markle adores, whilst also following the flag theme and designing the pizza to represent the red, white and blue of both the Union Jack and the Star-Spangled Banner. The pizza is topped with turkey meatballs, crayfish tails, cannellini beans, cherry tomatoes, parmesan shavings and chilli flakes, plus rather unusual blue carrots and lavender and garlic flowers, sourced and donated for this amazing pizza by Oliver Kay Produce of Bolton. Creating it on the US’s day of pizza, was a fitting choice, given Ms Markle’s nationality. However, there is more than one celebrity connection within this story. This particular topping was chosen by Mr Manciocchi when he learned that the turkey meatball recipe Ms Markle raves about just happens to be one perfected by Hollywood actress and A-lister, Gwyneth Paltrow. Ms Paltrow became one of his earliest customers, when he fitted a Valoriani oven in her home’s kitchen in London back in 2005. This link proved irresistible when he was devising the ‘Meghan’ Pizza. The ‘Meghan’ pizza recipe is available to anyone who wishes to try it out for themselves, but will be cooked best within a Valoriani oven – the ‘Mercedes’ of pizza ovens thanks to their unique ‘cotto clay’ shell, which has no equal when it comes to heating up and retaining the heat required for cooking the perfect pizza. Valoriani ovens are renowned the world over for their quality and longevity and the Valoriani family, based in Reggello, work alongside the Manciocchi family at Valoriani UK, to communicate their reputation across the world. Valoriani UK does also have its own pizza demonstration kitchen in Preston, where would-be garden pizza oven owners, or those wishing to cook the wood-fired way indoors, can learn how to make dough and the all-important tomato sauce for the base, stretch and twirl their pizza round and master the art of cooking with wood. It has extended an open invitation to Meghan Markle and Prince Harry, should they wish to learn how to cook the new ‘Meghan’ pizza’ at a private cooking class. Once removed from the oven add the cherry tomatoes can cannellini beans and sprinkle some carrot shavings and parmesan shavings on the pizza. Remove blue lavender petals from the stem by rubbing them in your fingers. Sprinkle across the pizza. Serve and eat like a princess!